NEW 2019 EDITION, WITH NEW CHAPTERS AND UPDATED INFORMATION! ENGLISH TEACHER X GUIDE TO TEACHING ENGLISH ABROAD is a brutally frank, often scathing, frequently profane, occasionally profound, but always insightful look at English teaching abroad in the 21st century, written by a TEFL veteran with more than 20 years of experience in numerous countries. A perfect guide for beginners and those thinking of entering the profession, it deals with a general consideration of the pros and cons of TEFL, and how to decide whether it's right for you; gives some general advice about how to find a job and choose a decent employer; and offers some advice for dealing with the most common problems experienced by newbies in the business of Teaching English as a Foreign Language. 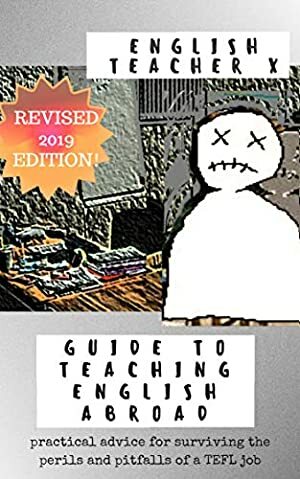 Written with heaping doses of ETX's mordant humor, cutting insight, and blistering sarcasm, it also includes interviews with experienced and novice teachers of English as a foreign language, classic ETX cartoons and essays, useful activities and resources, and updated information about typical salaries and conditions. This updated 2019 edition contains a new introduction by the author and new information about international schools and working in the Middle East. If you've ever dreamed of teaching English abroad... read this book first! Are you tired of your dead-end job? Are you feeling a bit boxed in by your tedious existence? Are you pretty sure there should be more to life than this? Well, so is English Teacher X. WARNING! THIS BOOK CONTAINS BAD LANGUAGE, VULGAR HUMOR, AND GENERALLY HAS A BAD ATTITUDE. Please don't read it unless you like that kind of stuff. Log In to track English Teacher X on eReaderIQ. to be notified each time the price drops on any book by English Teacher X.
to stop tracking English Teacher X. We started tracking this book on January 1, 2015. The price of this book has changed 13 times in the past 1,573 days. The highest price to date was $4.99 last reached on June 25, 2015.